If you were born in JANUARY or FEBRUARY, your birthday is special. 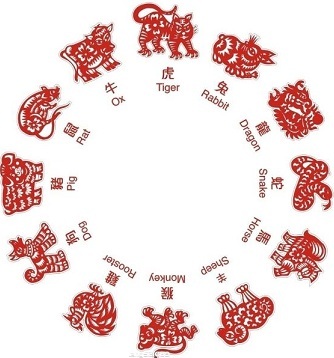 Here is the Chinese zodiac chart for you to find your zodiac animal sign. After you find it, come back to this page to have fun with your animal. Now, let's take a close look at these animals of the 12 Chinese Zodiac Signs. Ox is the second animal of the 12 Chinese Zodiac Signs. People born in the Year of the Ox are patient, quiet yet inspire confidence in others. They are eccentric and temperamental. They speak little but when they do they are quite articulate. Mentally and physically alert, they are generally easy-going but can be very stubborn and they hate to fail or be opposed. Oxen are natural born mentors and life is filled with examples of people who have gone on to great success because of them. They can create the most imposing structures, magnificent sculptures, and homes. They respond like poets to the beauties of nature and of solitude. Oxen are unique, they are the flower that bursts through the crack of cement. Bird's Nest Soup and Bean Curd are among the keys to good health. They are most compatible with Snake, Rooster, and Rat people. Which kind of OX you are? Tiger is the third animal of the 12 Chinese Zodiac Signs. People born the Year of the Tiger are deep thinkers and can make the most astonishing intellectual connections, with great mental agility. On the negative side, they tend to be suspicious and a bit self-centered, and sometimes indecisive. They are powerful, courageous and can have great sympathy for others. Despite their kindness, they can be extremely short-tempered. The rage of Tigers is terrible to behold but it also gives them the adrenaline needed for the sublimest of bravery. Above everything, however, the Tiger stands as a supreme emblem of protection over human life, admirable always. Tigers are most compatible with Horses, Dragons, and Dogs. Which kind of TIGER you are? Dragon is the fifth animal of the 12 Chinese Zodiac Signs. People born in the Year of the Dragon are healthy, energetic, excitable, short-tempered, and stubborn. They are also honest, sensitive, brave, and they inspire confidence and trust in others. They are the most eccentric of any in the eastern zodiac. They listen to their own drummer while the rest of the world stands in amazement. People always admire their individuality and feisty personality. They never borrow money, are very straight forwarded and tend to be soft hearted which sometimes gives others an advantage over them. Dragons are capable of doing great work for mankind and they inspire trust in almost everyone. The Dragon symbolizes life and growth and is said to bring the five blessings: harmony, virtue, riches, fulfillment and longevity. They are compatible with Rats, Snakes, Monkeys, and Roosters. Chicken soup and bamboo shoots are among keys to good health. Snake is the sixth animal of the 12 Chinese Zodiac Signs. People born in the Year of the Snake are charming and romantic, often planning delightful hideaway surprises. Snake people normally like music. They are calm by nature, but intense, often get involved in great causes, many bigger than life. They are also deep, quiet thinkers, possessing tremendous wisdom and often serve as mentors to the young. They enjoy an abundance of good fortune and a prosperous life. Chicken soup and Chinese cabbage are among keys to good health!